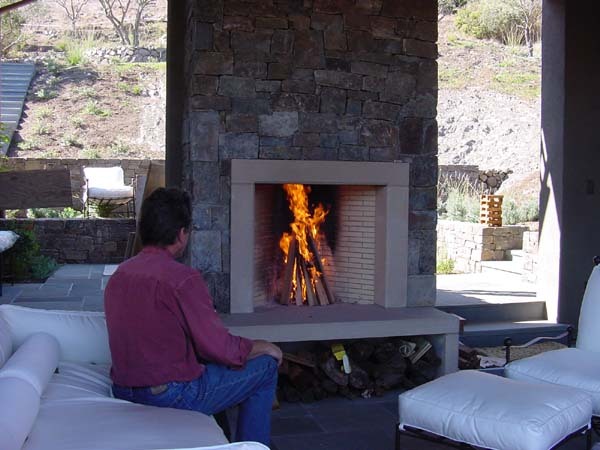 Most of our customers really like their outdoor Rumfords but, remember, we said, "Outdoor fireplaces may smoke in a breeze so shelter the fireplace from the wind, build the chimney as tall as you can and build the fireplace opening a little lower to improve draft." 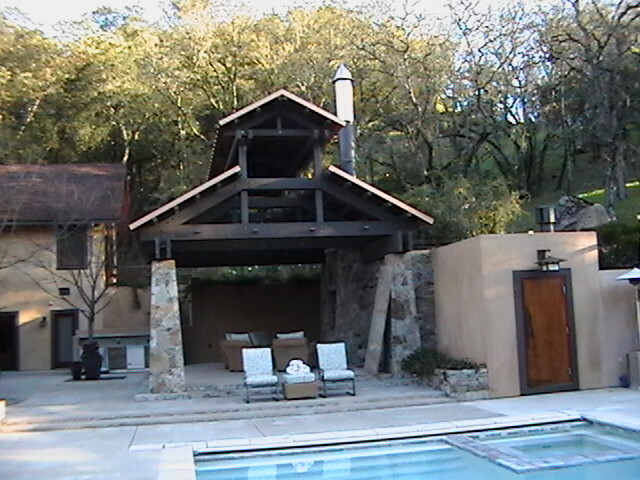 One fireplace is built in a breezeway (that should be a clue) between two rooms of a guest house on a California valley hillside. 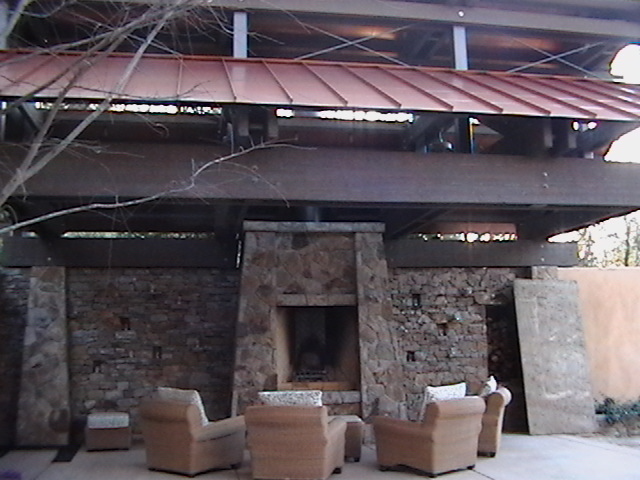 In the afternoons the interior of California heats up and the rising hot air draws freshening breezes from the ocean up these valley hillsides - right through our breezeway - causing the fireplace to smoke. The fireplace works fine in calm air but not very well in a typical breezy afternoon. 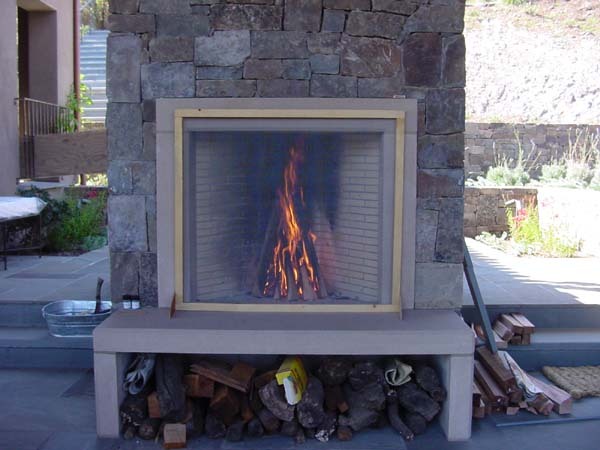 Our suggestions: Add a screen in front of the fireplace opening to filter and restrict the turbulent air flowing into the firebox. Blocking the breezeway openings so that the wind can't blow through the breezeway helped but we all agreed that adding glass doors on the fireplace opening that could be closed if the wind got too strong for the screen to work would be the best second level solution. Another troublesome outdoor Rumford is in a backyard space totally surrounded by the house, the neighbor's house and tall shrubbery. 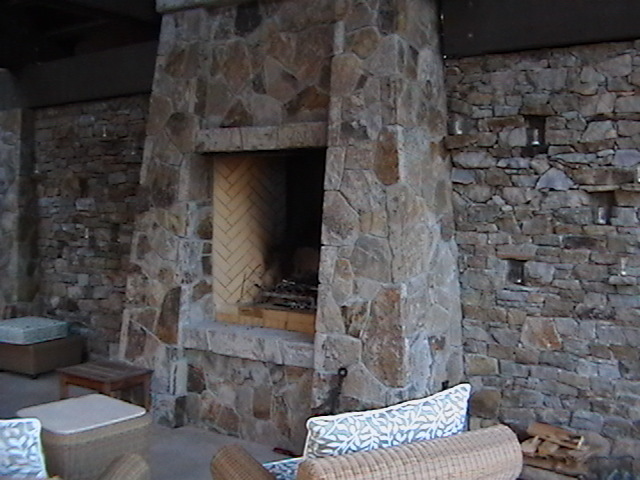 The fireplace draws okay but then the smoke coming out of the chimney gets caught in a turbulent downdraft and swirls down into the patio area. 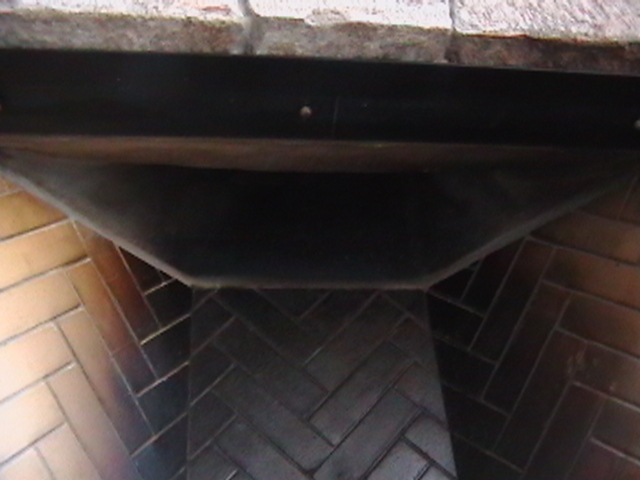 The downdraft also causes the fireplace to smoke a little out of the opening but the main problem is the local "inversion" or air pattern that traps the smoke that has already exited the chimney. 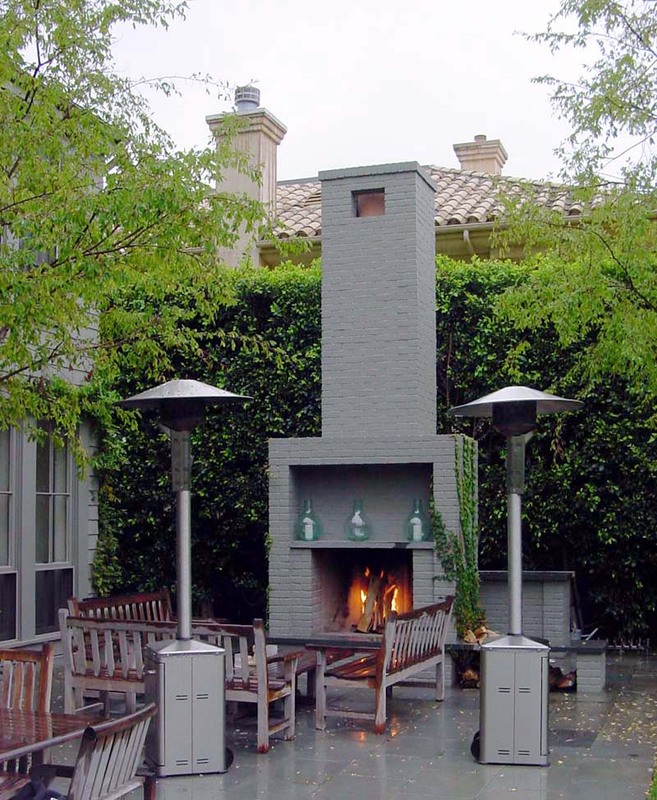 Our suggestions: Build the chimney taller to get the top out of the turbulent air. We were concerned that the chimney might have to be built ten feet taller to get it above the nearby roofs so we also suggested an alternative might be to install gas logs in the fireplace. Products of combustion from the gas logs might still swirl around the patio but they wouldn't smell like wood smoke and, being outdoors, they would dissipate safely. A 48" Rumford was built to specifications but was temperamental because it is in a breezy area. With the slightest breeze the smoke swirls clockwise as the breeze comes into the shelter from the right side. Before I got there the contractor and mason had installed a chimney top fan and had experimented with a screen, raising the inner hearth and with tipi fires. The fireplace was also fitted with a propane gas log lighter. Trying to isolate variables when I visited the site, I found that all of the above measures helped but none made a dramatic improvement. The fact that the fireplace was built under an enclosure with only one open side facing the wind was a problem we hadn't anticipated. Even if the fireplace smoked just a little, the smoke was trapped in the shelter and couldn't escape. Fire building: No doubt a tall tipi fire with no grate was easier to manage than any fire with the logs laying horizontally. Fan: The RS16 Exhuasto fan noticeably improved the draft when turned half way or all the way on compared with not turning it on but still didn't capture all the smoke when it was even slightly breezy. We couldn't get the fan off the top of the chimney so I really couldn't tell if the fan impeded the draft when it was turned off or how much, if any, it improved draft as compared with no fan. Raised hearth: The fireplace is a full 48" tall and adding two layers of firebrick to raise the inner hearth did improve draft. Screen: A traverse rod style screen also helped to mitigate the smoking by diffusing the force of the breeze at the fireplace opening. Side blocking: Standing a two-by-four at the side of the fireplace opening to block the breeze seemed to reduce the force of the breeze directed into the firebox by the extended surround. We thought the screen might do the same thing but it's worth noting that in future perhaps a double return or building the opening within a recessed panel would be better than extending the surround straight out to catch the wind as with this fireplace. Management techniques: When the breeze causes the fireplace to smoke, turning the fan up to high, adding more wood or turning on the gas starter so the fire burns brighter and drawing the screen all seemed to help. Even then a gust of wind would periodically cause the fireplace to spill smoke. Plan: For this fireplace the mason will rebuild the hearth and hearth extension up about 8" to effectively reduce the height of the opening to 40". He will also re-install the sliding screen within a "U" channel, rather than an angle, so that he can bring down and streamline the throat, with refractory mortar, to the back side of the "U" channel. In the end we are back to not over-selling outdoor fireplaces. They do tend to smoke in a breeze. Not perfect solutions for the owners of these three fireplaces but we highlight them here so that you might avoid these problems. 1) Shelter the fireplace from the wind. 2) Build the chimney as tall as you can. 3) Build the fireplace opening a little lower. 4) Don't build it too near the house or other tall obstructions - or build the chimney taller than these obstructions. 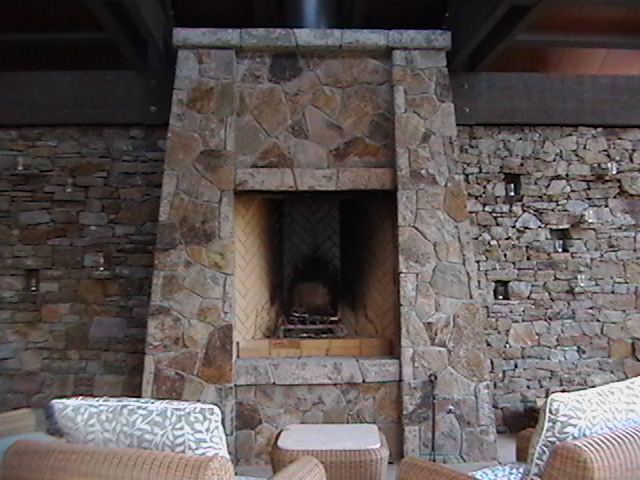 5) Add a screen in front of the fireplace when it's breezy or even glass doors when it's really windy. 6) If you build the surround out more than 4" to make the fireplace deeper, don't come straight out as it seems to direct any breeze into the fireplace. Rather build the surround out in two or three steps to discourage the breeze. 7) If the fireplace is built within an enclosure or porch make sure there is a way for any smoke that does escape to get out of the enclosure through a skylight or leeward window. 8) Of course, seasoned wood, tipi fires and the realization that it is an outdoor fireplace after all and probably will smoke occasionally, all help too. 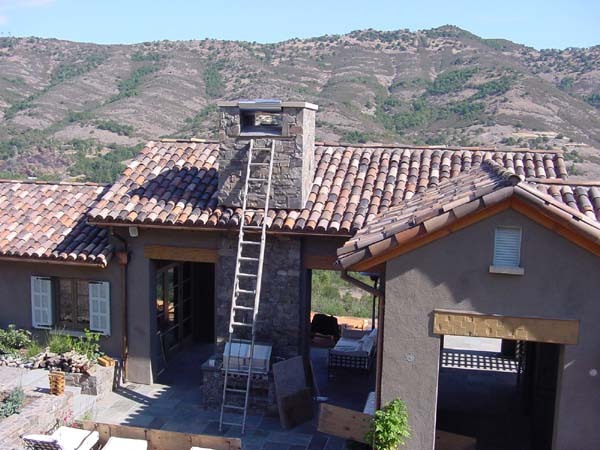 You can add a chimney pot to increase the effective height of the chimney.